Last Wednesday we had a WeekNight Testing session. There was something special about this session. It was announced as a live session. 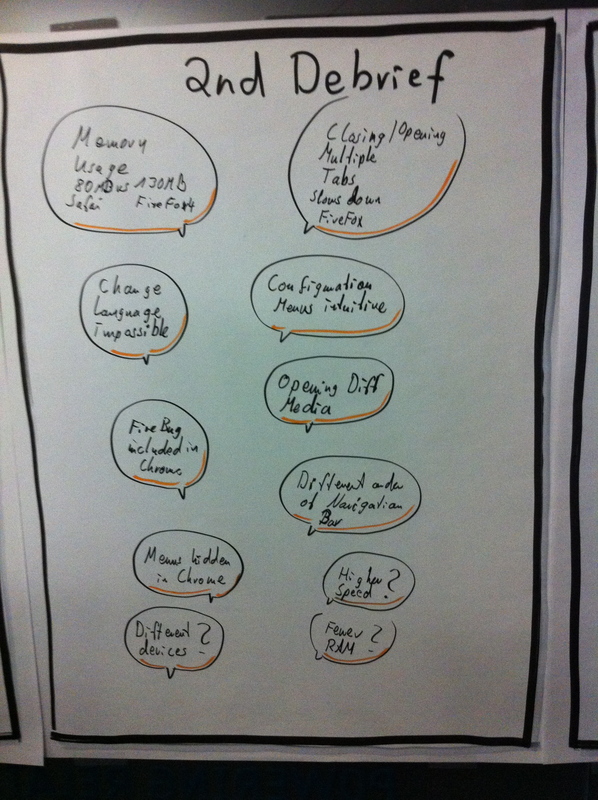 Mike Scott contacted me in February, asking whether I could organize a live session in Hamburg, while they were bringing in a gig at SkillsMatter in London. 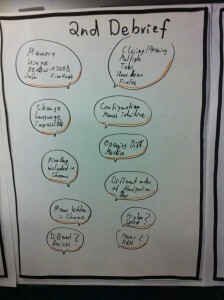 Earlier in March we got also a session organized in San Francisco by Lisa Crispin. 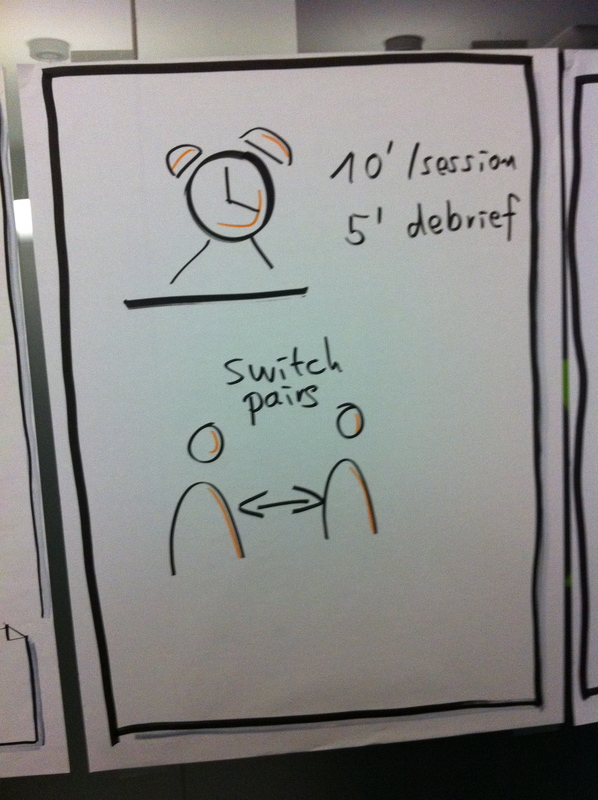 So we ran the session in parallel in three different locations. Besides the official session report, here are some thoughts on how I ran the session in Hamburg. As Jerry Weinberg points out in Becoming a Technical Leader, one way to achieve innovation is by combining two ideas. 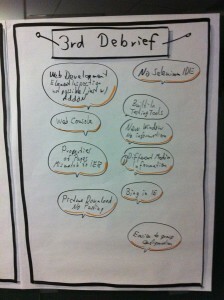 Earlier in 2009/2010 I came up with the idea of Testing Dojos motivated by Coding Dojos. Ever since I crossed the idea of Weekend Testing I had the idea to combine the two things somehow together. We had an opportunity to try this out at the TestLab at last year’s EuroSTAR conference. Now I had the opportunity to run this in a similar way. While Mike Scott proposed to run the local sessions as a Testing Dojo, I thought it would be more worthwhile to run multiple local sessions, and get together from time to time, and lead a short debrief. After that we switched pairings, so that we got cross-cutting thoughts on at least two levels: the debrief and the pair switching. That’s why we headed for ten minutes of testing, a quick five minute debrief, and then setting up for another session. 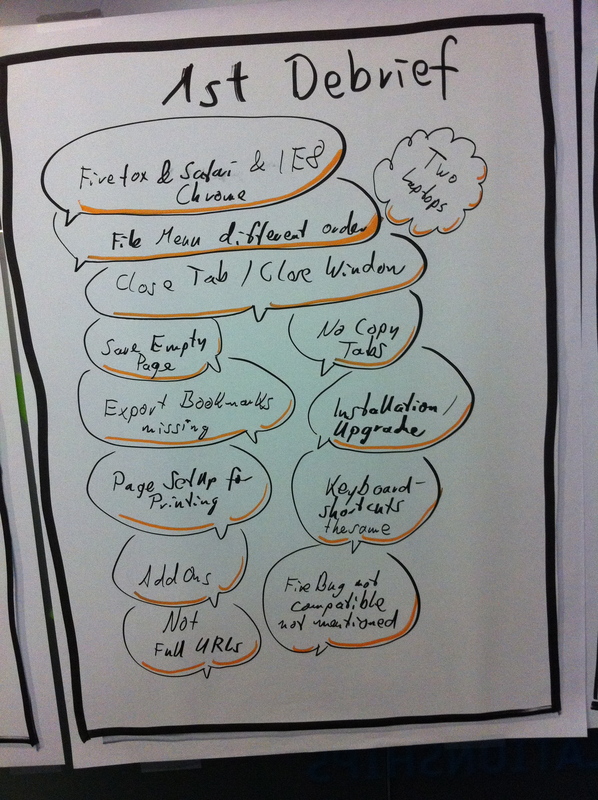 Here is the flip chart that I drew with the instructions in Germany. Given the time that we had, I thought we might fill in three to four sessions within the hour of time that we got. 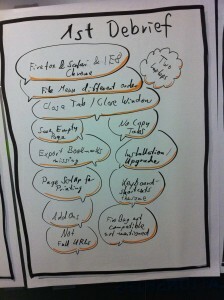 While doing the debriefs, I drew flip charts with the notes I could get from the participants. 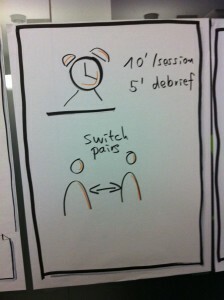 In order to do that I applied some skills I learned in early February as part of a Visual Facilitation Workshop. 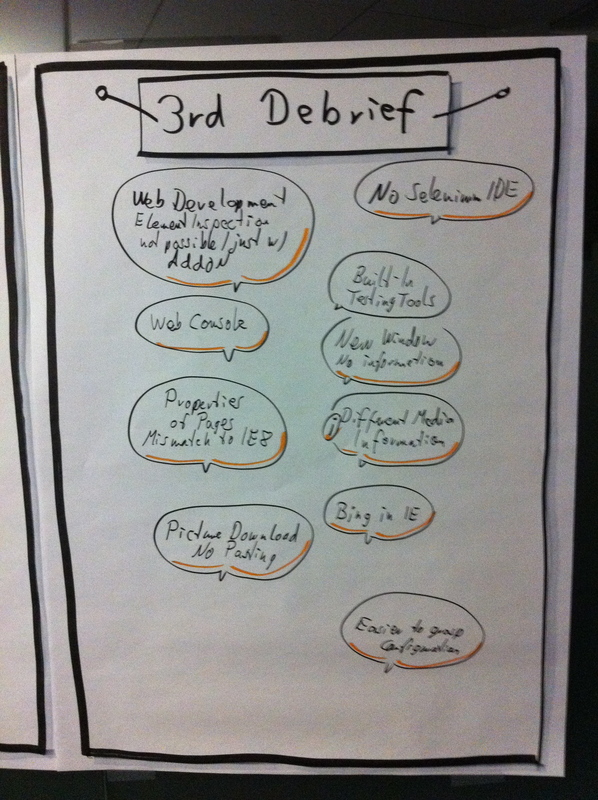 Here are the flip charts from the three sessions that we could run after all. We got five testers in Hamburg together. So, we had two pairs and one individual tester in each session. It was an awesome session, and together with the results from the debrief, we could easily contribute to the overall debrief after the first hour between London, San Francisco and Hamburg. Nothing new ever works – but there is always hope that this time will be different. Citing Pandorra’s Pox from Weinberg’s Secrets of Consulting, here are some lessons that we learned, and the potential I see for future live sessions with multiple locations. Over the internet many participants tried to join us. Unfortunately video and voice talk was not available to them. This felt a bit tragic, as I would have truly wanted to get to know what others were doing considering myself to be in that chat. So, either we might want to choose to leave out the Skype chat from such sessions, or find a way for everyone to participate. The second option sounds more appealing to me. During our sessions we did our thing in the different locations. Unfortunately we didn’t take much time to see what others were doing, but focused on the mission locally. During the whole first hour I didn’t get what others were doing, but tried to be a good host for Hamburg. This worked well, but just for Hamburg. London and San Francisco faced similar challenges. Lisa and Mike did a great job facilitating the two other locations, so this worked well, but we had the need to coordinate afterwards. For next sessions I would like to see everyone in one large sessions, but that probably needs a change to how we run the session format, I suppose. Skype itself was a problem during the second hour. It was hard to listen to each other, and even harder to participate. So, I would rather get rid of Skype completely, and find a video and voice chat tool that has better sound quality. After all, I thank all the participants in Hamburg, London, San Francisco, and on the internet. It was a great session, but I couldn’t test according to the mission, but was heavily facilitating. This leaves me open to test the product according to the mission now, but I had the urge to fill in the facilitation role solely. Special thank to Sharath who coordinated the Skype chat and much of the organization around this event. Mike and Lisa for facilitating, and I hope to do this thing again. Awesome evening for me. Thanks. Hi – U.S.-based software tester here. Has anyone explored Cisco’s Webex as an alternative to Skype? I’d really like to be able to participate in a WeeknightTesting session from work sometime (taking a cue from Lisa Crispin). I have Webex on my desktop but not Skype and I’m not sure how our network admins would feel about Skype. Since it looks like you might be evaluating some new tools I figured I’d throw the option out there. Hello, Markus. I have a similar question like Amy and I wanna ask what about another kind of webinar software except of Skype and WebExe, I heard about GoToMeeting and would like to compare prices on it but everything that i found is this web site http://pc24.de/cisco and nothing more… Can you advice me some another links?